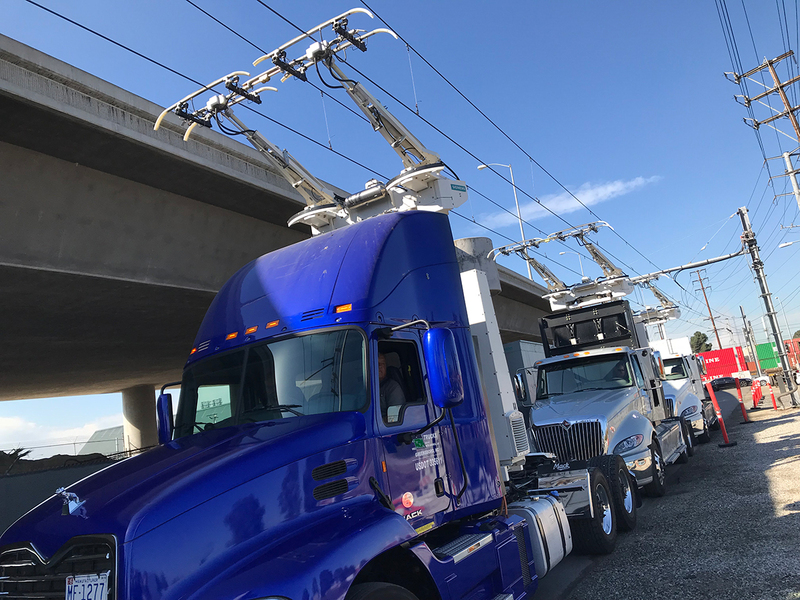 A one-mile electrified highway has gone live with three heavy-duty trucks running between the ports of Los Angeles and Long Beach, Calif., as partners Siemens and the South Coast Air Quality Management District seek to cut emissions from trucks serving the two largest U.S. ports. Each of the trucks in the test is using a different power system: a battery electric, a hybrid natural-gas electric and a diesel hybrid. The trucks are driving on the northbound and southbound lanes of South Alameda Street, from East Lomita Boulevard to the Dominguez Channel in Carson. The trucks in the $13.5 million project are powered with an overhead catenary system, similar to a trolley, featuring an overhead contact line providing power to the vehicle. On top of each truck is a pantograph that transfers energy from the overhead line to the vehicle’s electric motor, allowing it to operate with zero emissions, according to Siemens. The natural-gas hybrid and battery electric trucks were developed by Escondido, Calif.-based TransPower, and the diesel hybrid was developed by Mack Trucks, a division of the Volvo Group. The goal is to reduce smog-forming, toxic and greenhouse gas emissions around the ports. “This electrified truck system, what we call eHighway, can modernize the existing infrastructure using the latest technology to accommodate the growing amount of freight traffic, reduce harmful emissions and keep these ports, one of our country’s major economic drivers, competitive,” said Andreas Thon, head of turnkey projects and electrification, North America. Siemens launched a 2-kilometer eHighway in June 2016 near Stockholm, Sweden, with two biodiesel hybrid trucks from Scania, the Volkswagen subsidiary. The South Coast Air Quality Management District is the air pollution control agency for Orange County and parts of Los Angeles, San Bernardino, and Riverside counties.